Since the turn of the millennium, total public agricultural R&D investments and capacities increased in most ASARECA countries. The growth in investments was largely the result of increased government commitments, although agricultural R&D continues to be highly dependent on donor funding and development bank loans. Furthermore, increased government contributions were most often directed toward salary increases and improvements to infrastructure and equipment. Despite the increases in overall numbers of agricultural researchers, average qualification levels in some countries deteriorated while other countries are facing an increasing aging researcher pool. The latter is often the result of recruitment freezes and increasing staff retention. 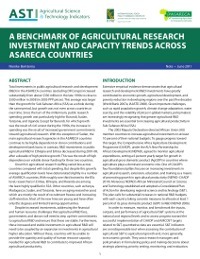 Higher levels of investments are needed to counteract decades of underinvestment in agricultural R&D, because overall investment levels in most SSA countries are still below the levels required sustaining agricultural R&D needs. This is despite the increased commitments of governments, donors, and development banks in recent years in some countries. Stable and sustainable levels of government funding are needed to halt excessive volatility in yearly investment levels caused by a high dependency on unstable influx of donor funding and development bank loans. Governments will need to identify long-term national R&D priorities and design relevant programs while donor funding will need to be better aligned with these priorities. Governments and donors need to address the existing and imminent challenges in human resource capacity to enable agricultural R&D to satisfactorily respond to emerging global challenges. This includes an expansion of investments in agricultural higher education to allow universities to increase the number and size of PhD and MSc programs and to improve curricula of existing programs. These four key areas will have to be addressed by government, donors, and other stakeholders will African agricultural R&D overcome the various investment and capacity challenges it faces.